ECGC is a three-day event (Tuesday through Thursday) with the first day being a short afternoon session. 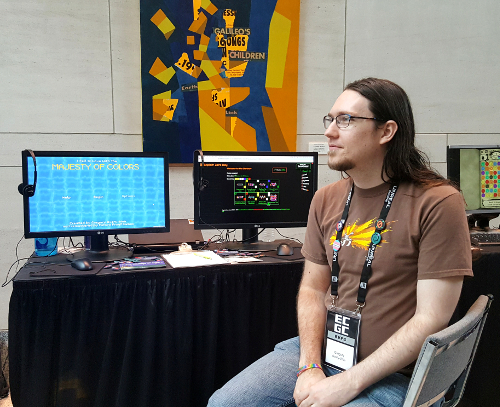 The first day we had two PCs set up demoing our remaster of "The Majesty of Colors"; on subsequent days, we had one machine running "Majesty" and one showing off Exploit: Zero Day. Having two games to show was kind of nice; it meant that we were able to attract folks who might be interested in one and not the other, and some people stayed to try out both. 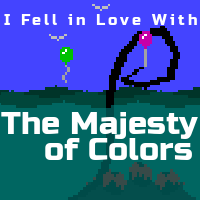 The feedback on "Majesty" was especially useful. Despite the old Flash version being out since 2008, we'd had little opportunity to see players interact with it en masse. Seeing the things people tried to do or didn't understand led us to add a number of enhancements and extra features to our to-do list that should really help make the game feel more responsive and alive. We made sure that people that end up behind the island get washed back out to sea to prevent them being lost. Happily, all these adjustments worked, nothing broke, and the game was well-received the following two days. Thank you to everyone who attended! We look forward to staying connected with the cool folks we met at the conference and we're excited about revisiting the Raleigh area next year. For more on our ECGC 2017 experience, check out our short videos of each day's setup.